Hedge funds and large-scale speculators active on the gold derivatives market are betting on further declines. According to the CFTC's weekly Commitment of Traders data up to August 7 released on Friday speculators pushed the net short position (bets that gold will be cheaper in future) to a record of 63,282 lots or 197 tonnes. Bearish positioning now exceeds levels last seen at the end of 2015 when gold briefly dipped below $1,050. Retail and institutional investors in other paper markets for gold are also abandoning the metal. Holdings in SPDR Gold Shares, by far the largest physically-backed gold ETF, last week shrank to the smallest since early 2016 at 786 tonnes. Investors have pulled nearly $2 billion from the New York-based fund so far this year. A report released earlier this month by the World Gold Council shows gold demand for the first six months of 2018 sank to its weakest in almost a decade on the back of waning investor demand. July was the fourth straight month of declines in the gold price, the metal’s longest losing streak since 2013. 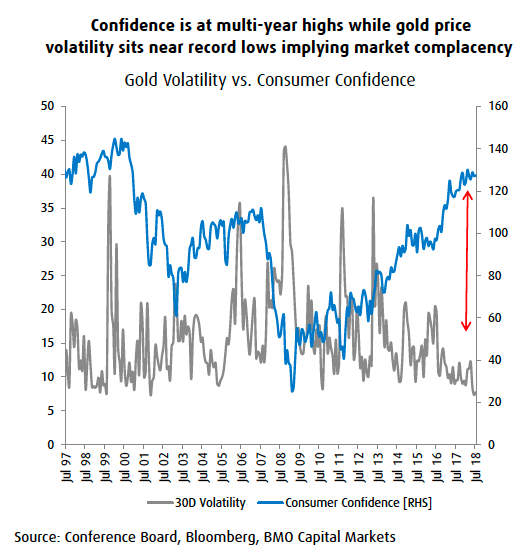 Volatility in gold prices is at its lowest level since 2001 – when the dot-com bubble was unwinding – such that the last four months have seen steady decline. Historically, when prices have exhibited such a trend it’s been largely due to headwinds from a stronger USD. action with China-US trade friction continuing to escalate. 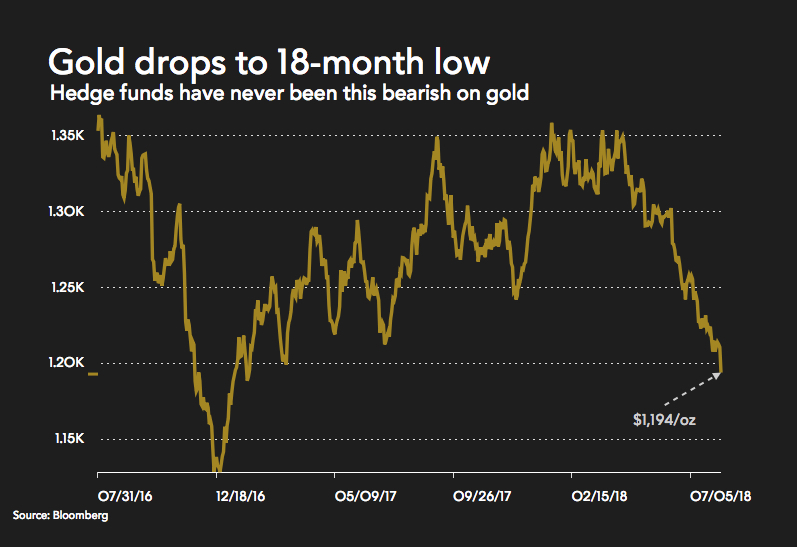 The last time we saw gold break out of a steady downward trend was in January 2016, as chaos in Chinese equity markets sparked an equity sell-off and rotation into gold as a safe haven. While we expect China to backstop growth over the next year, partly via infrastructure spend renaissance, trade friction has seen the Shanghai Composite Index fall to levels last seen in early 2016.